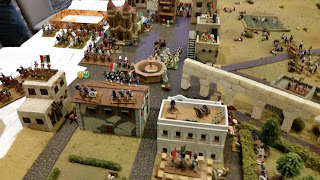 So, last weekend I was at KublaCon, a four day Con at the Hyatt Regency in Burlingame, CA. Speed-Painting contest! Can you paint a masterpiece in 40 minutes? Give it your best shot, and win fame, fortune and...Kublabucks! All materials are provided, and contestants are judged immediately after by Kubla Staff. Winners are invited back for a Masterclass Speed-painting session Sunday evening at 6:00 pm. Pretty much as advertised. They gave ten of us the same mini, the same set of paints, the same brush, and generously allotted an extra five minutes. We were told to concentrate on the mini, not the base. There was some good-natured ribbing from my neighbor about how one was supposed to use as much bubble-gum pink as possible. 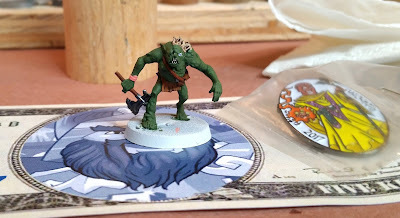 Fellow contestants ranged from pros to people painting their first mini . . . ever. And we were off! One of the hardest parts was using somebody else's paints, which had been in storage since last KublaCon. Everybody has their own mixes and preferred colors for shading, highlighting and washing, none of which were available here. Nor were said paints in the dropper bottles used by Reaper, Vallejo, and so forth - which allow for ready mixing. 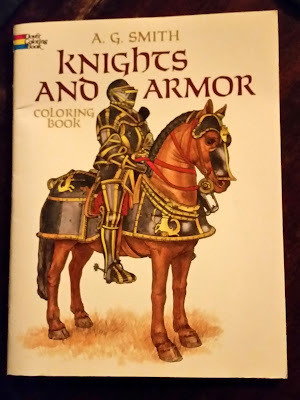 It was old-school with the linked acrylic paints you get in model kits for kids. I give you Urz the Destroyer, known to his friends as "Steve"
I'm quite proud of his bright blue eye, the slight gold tinge to his teeth (good old Goblo-Orcish dentistry there! ), and the use of "bubble gum pink" and "melon" on his bracelet. The leatherwork came out rather well, too (raw and burnt umber, IIRC). I came in third, with an invite for the 6PM Sunday Masterclass SpeedPainting! contest. Late 15th century battle between France and Austria. 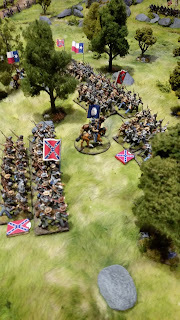 DBA 3.0 Big Battle rules with 15mm figures. I'm a long-time DBA player, but hadn't had the chance to play the new(ish) 3.0 rules yet. Guingate was part of the Wars of the Burgundian Succession, and an interesting scenario. Both the French and the Habsburgs had two wings of knights and lots of artillery. The Habsburg center were pikemen, the French center the franc-archers. I had the French left wing, artillery, knights (always pronounced k-nigh-its), and a stand of dismounted men-at-arms. My artillerists pretty clearly ate their Wheaties, rolling hot to destroy the Habsburg artillery in counterbattery fire, then tear up their supporting crossbowmen, then defeat the Habsburg pike in melee (must have been a double load of canister!). Rolling a lot of sixes helps. I suppose I actually have to pay them now . 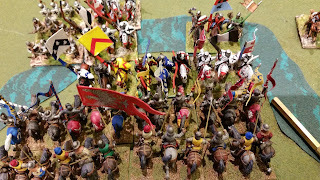 . .
My knights charged up the hill, soundly thrashed their Habsburg opponents, watched them flee toward the river in their rear, ready the pursuit, and look to the right to see the rest of the French army broken and streaming from the field. L'oops! Who doesn't like Gens d'Armes? This was the game I had come to play. I love colonials, and The Sword and the Flame is always an absolute blast to play. 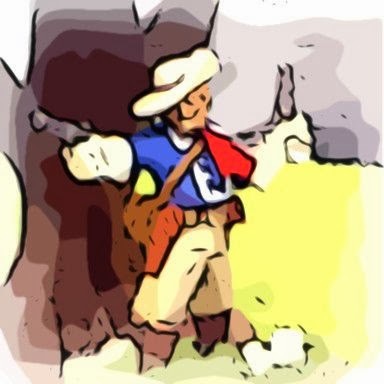 I am a serious fan of Science vs. Pluck, have played a whole host of enjoyable Plains Wars games with a homebrew ruleset, and naturally have my own ideas on one, but The Sword and the Flame is the granddaddy of them all. 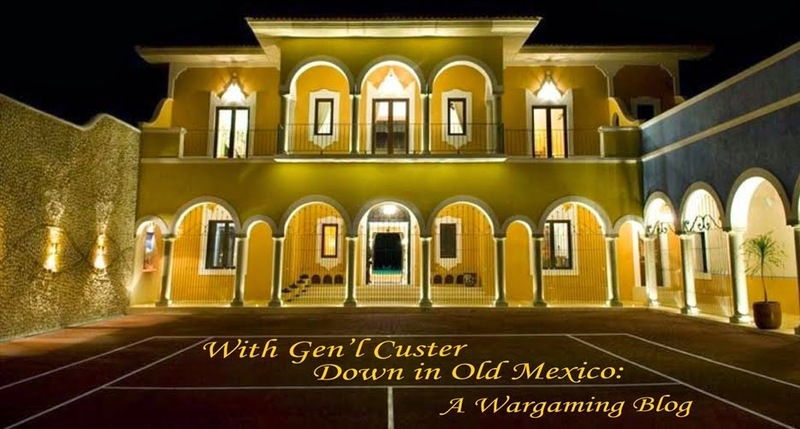 Colonials brings in an element of roleplaying that is often lacking in other periods, and that is a major appeal. 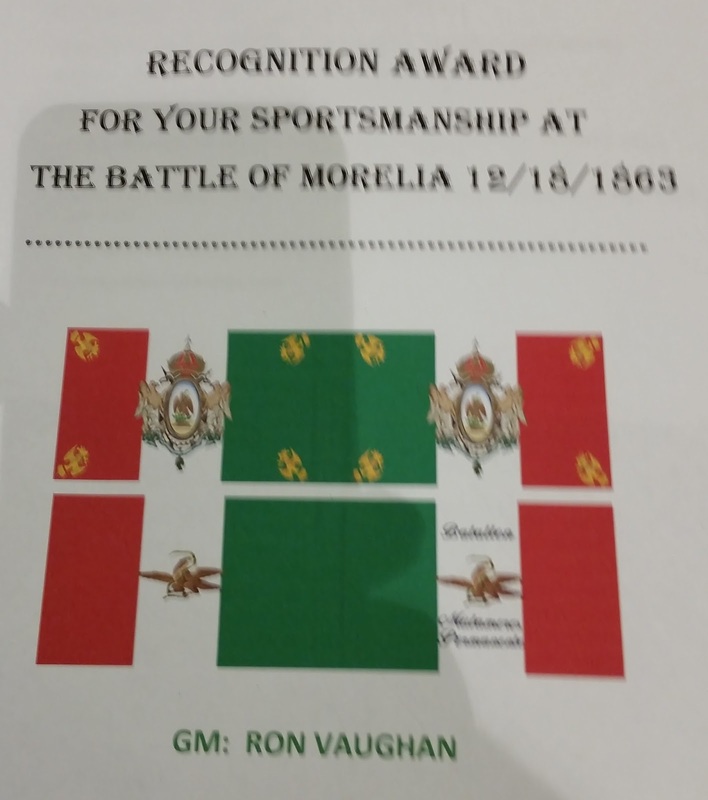 We were playing at more of the "800 Fighting Englishmen" scale, where a unit was a regiment, but it worked. 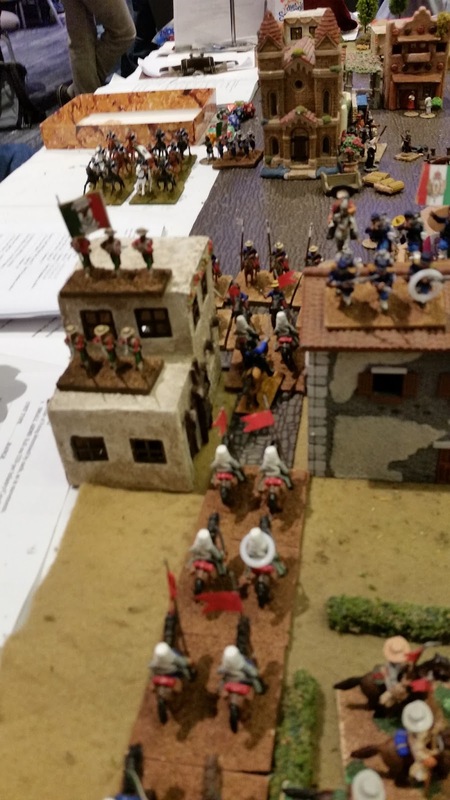 I had the cavalry and two infantry brigades, tasked with taking the city's outskirts past the aqueduct and pushing into the city's flank. The advance was . . . ragged. 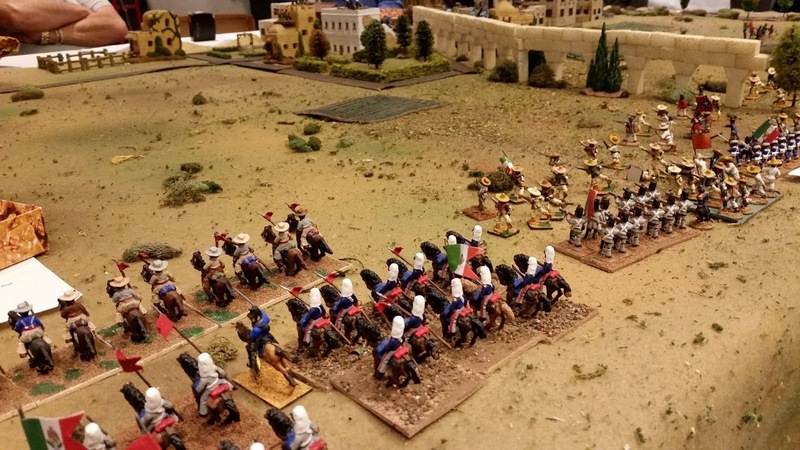 My cavalry and machete armed militia were keen to get to grips with the Maxamillians (routinely maxing out the movement dice), while the regular infantry sort of brought up the rear (what can you do when you roll 2 ones on 2d6?). With the Maximilians armed with modern rifles and in Category IV cover, there really wasn't much to do but close as fast as possible. A great cheer went up as we took the first building in hand-to-hand combat. 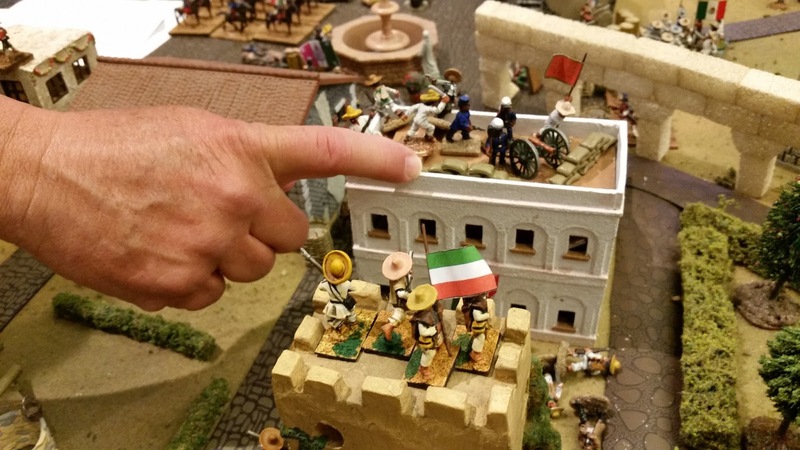 One militia unit was almost completely wiped out by defensive fire, only a brave seniorita and the Mexican flag surviving the hail of lead to make it to the first floor door. 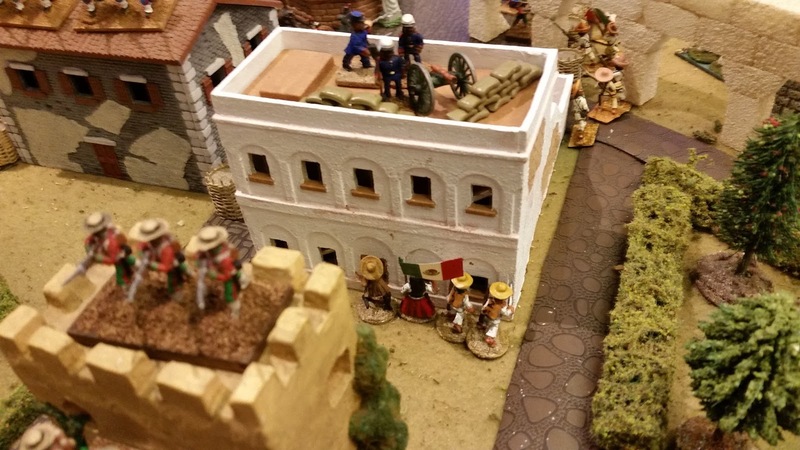 With the Maximilian artillery still holding out on the roof of the white building, a further push was needed. Militia dashed across the narrow street into the basement of the white building. French sappers (boo!) tossed grenades in through the courtyard and followed up. Yes, that Frenchman with a pistol. Machete him! All to no avail. The French held the building. Up came the cavalry, lead by their valiant brigadier, to charge the barricades and guns closing the streets. Hey, it works in the movies. Demolishing one barricade, a gray-clad regiment of Mexicans charge in. Vile contra-guerillas clatter through the streets to meet them. The Brigadier draws his sword and pistol . . . 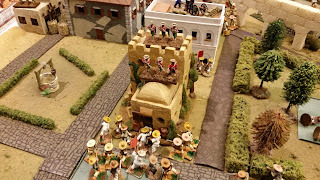 Fierce fighting in the narrow streets. The lead lancer goes down, then another one. The Brigadier kills his first man, then his second, then the colonel of the contra-guerillas! A fourth falls, then a fifth. Calamity! A vile contra-guerilla skewers the Brigadier, and he falls to the ground, dead (bad time to roll a one, slick). 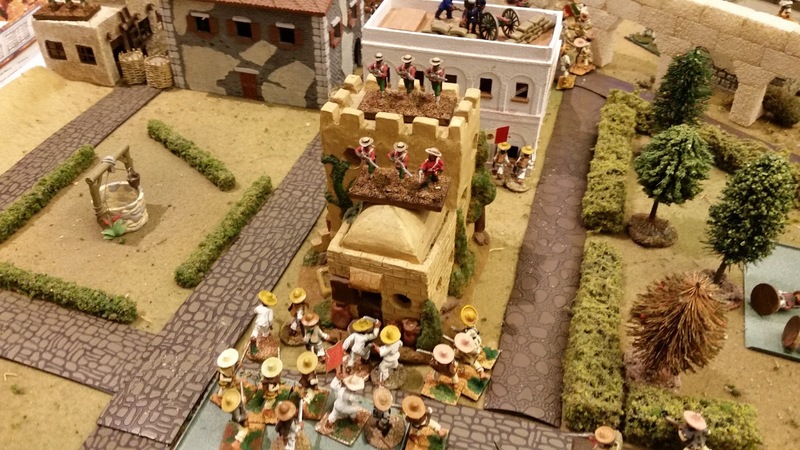 Ultimately, the cavalry pressed through both streets, aided by the capture of several buildings on the other side of the canal. 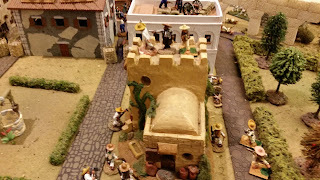 Note the Maximilians still hold all three of the outbuildings, it being very difficult to survive defensive fire with small, shot up units, and even harder to kill the key figures with musketry. Come and battle some of the greatest monsters the world has ever known! 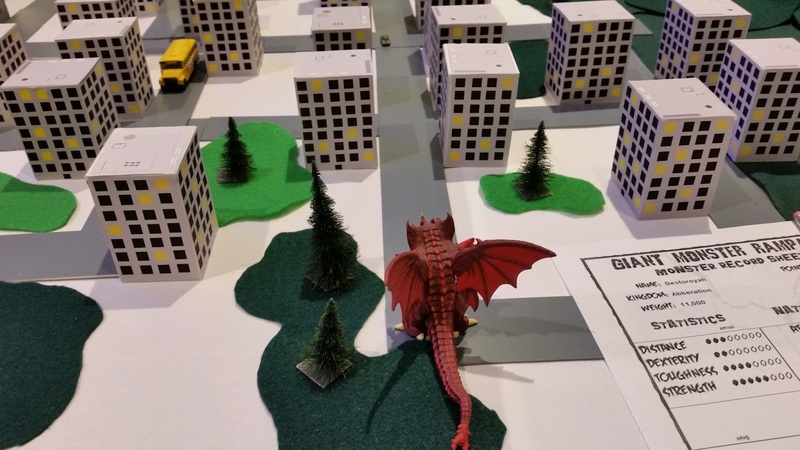 Rain destruction down upon the unsuspecting citizens of the city and see who will be king of the monsters! This looked like a fun game. Who doesn't like giant monsters and destroying poor defenseless cities . . . erm, urban renewal? Ultimately, I gave up my spot so a little girl and her dad could hop in. 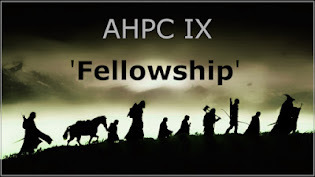 After all, who doesn't want to encourage new blood in the hobby? Walking by from time to time, it certainly looked like people were having fun, and the city pretty much in ruins. 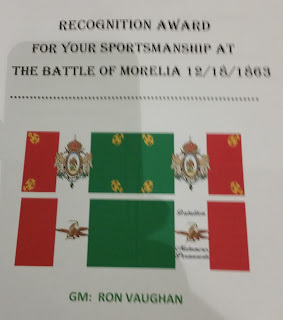 De Bellis Antiquitatis 3.0 Tournament (15mm). Bring your own armies, but there will be many armies provided as well. Come and try out the new version of this classic quick play Ancient Rules. This was both fun and a disappointment. 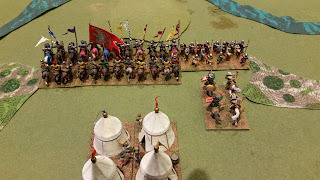 Fun because I liked what I had seen of DBA 3.0 on Friday, and had a beautifully painted Later Polish army on loan from the gamemaster to play with. Disappointing because there were very few other players. I ended up doing best 2 out of 3 with a player fielding Teutonic Knights (boo! ), and one or two people joined in later with some Classical Greek armies. The Later Polish army was fun, but had one serious problem - the knights. 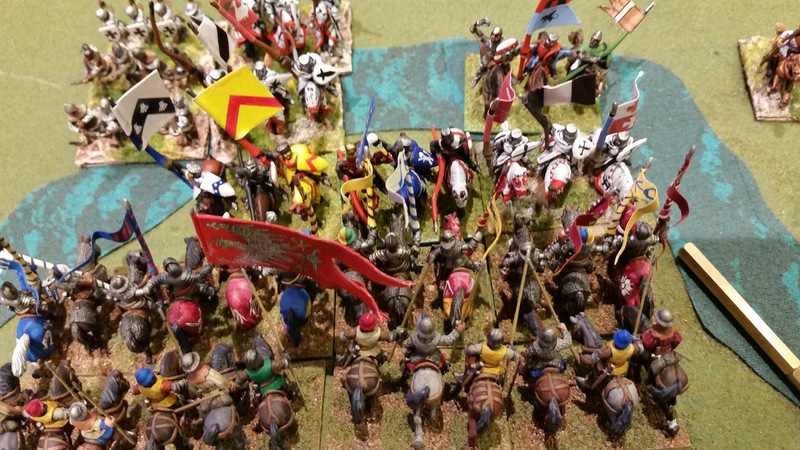 In DBA, if a knight wins a combat, they must follow-up. Inevitably, if you don't roll high enough in melee, that results in pushing the enemy back just enough so that one stand of knights penetrates, gets doubly-overlapped, and killed when you equally inevitably, roll a 1. Which is pretty much what happened. As the defender (Aggression 1 means you're almost always the defender against a high aggression army), you get to set up the terrain. One item I picked is the infamous Barker river, which can be paltry (1-2 on a d6), slow things down (3-4 on a d6), or slow things down and aid the defenders (a 5-6 on a d6). Seeing the Teutonic knights hung up on the river, I sensed opportunity. We charged down off the hill in the bend, caught them in the water, pushed them across, and then promptly died as the fatal overlaps kicked in. What do you mean, don't roll I? 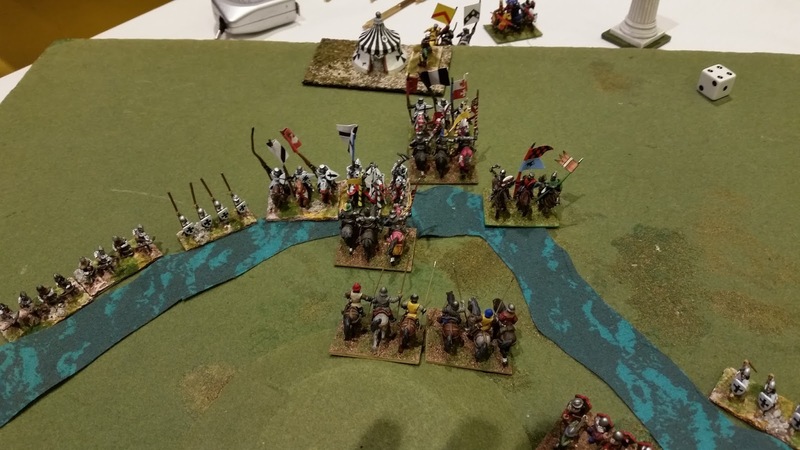 Game 2, I replaced the river with a built-up-area, garrisoned it with crossbows, and readied for the inevitable clash. Fewer photos this time, but it pretty much played out the same way. 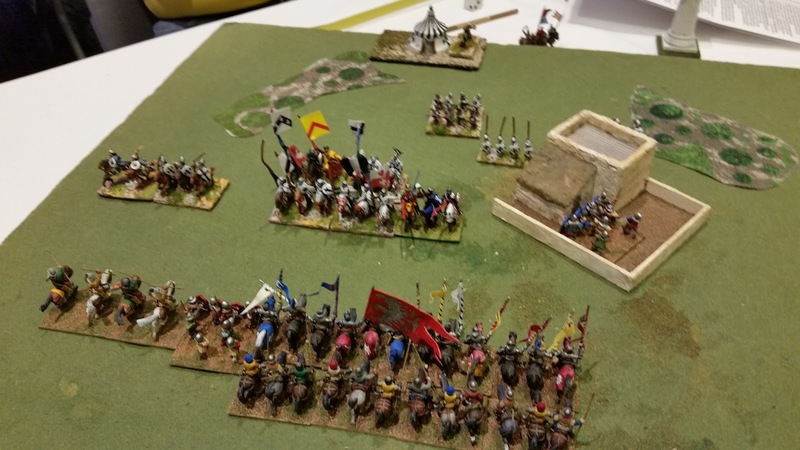 My Polish knights would defeat their Teutonic counterparts, driving them back but not killing them. 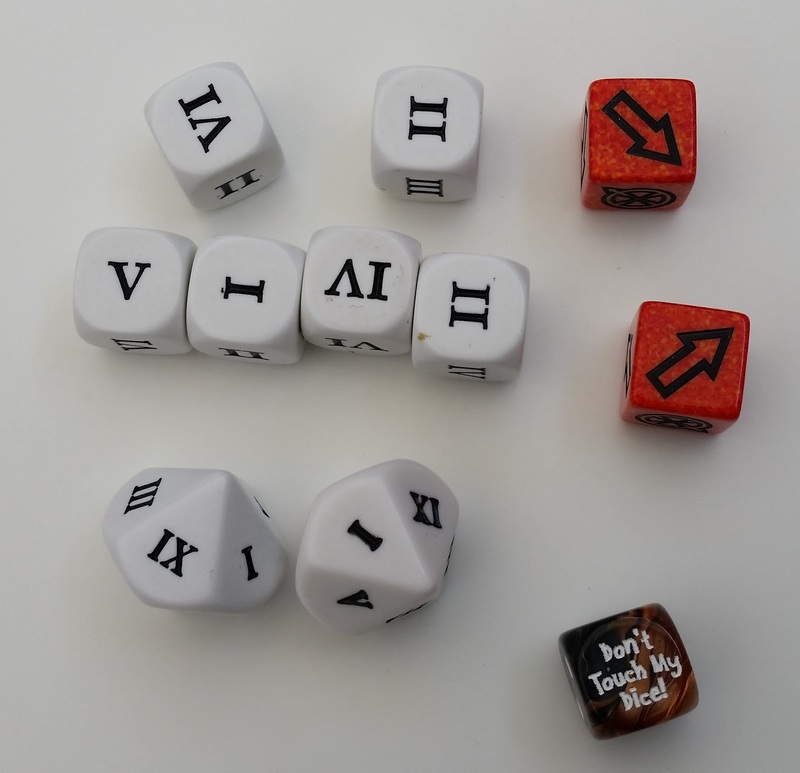 Once stuck into the Teutonic ranks, I'd roll an I (I was using roman numeral dice) and die. So, two 4-3 victories to the Teutonic Knights, for a 2-0 result overall. 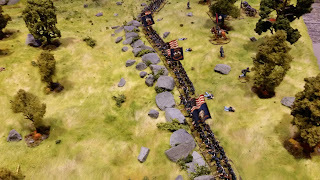 DBA 3.0 is quite different from DBA 2.2, and well worth purchasing and dusting off my armies. The fighting at the Little Round Top during the Battle of Gettysburg was made famous by the actions of the 20th Maine. 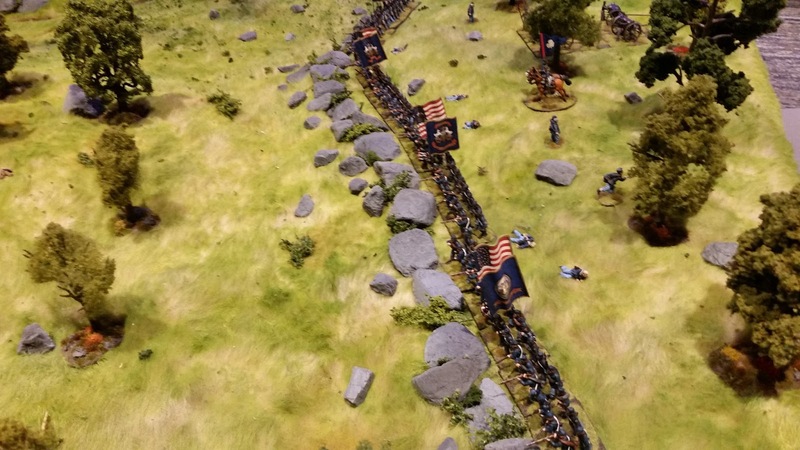 Complete with that action, and the action around Devil’s Den, can the Confederate army push the Union flank? 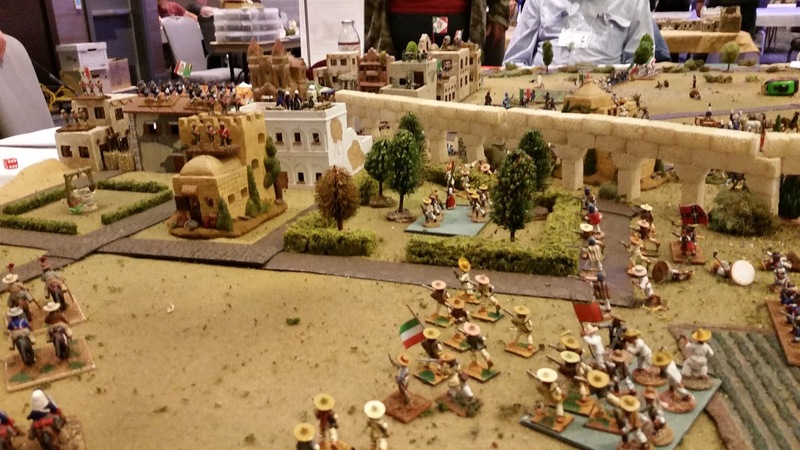 This was the last of seven games put on by a gaming group out of Fremont, CA. 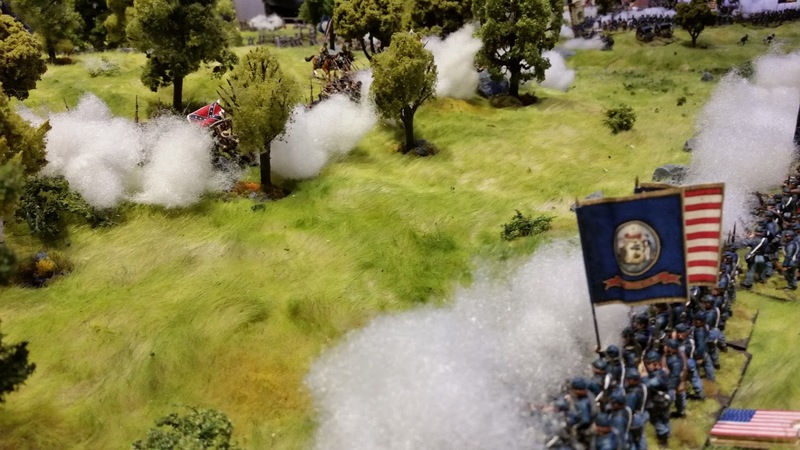 Consistently, they had the best looking games at the Con, and you can read their summary (and drool over the photos) at Jay's Wargaming Madness. 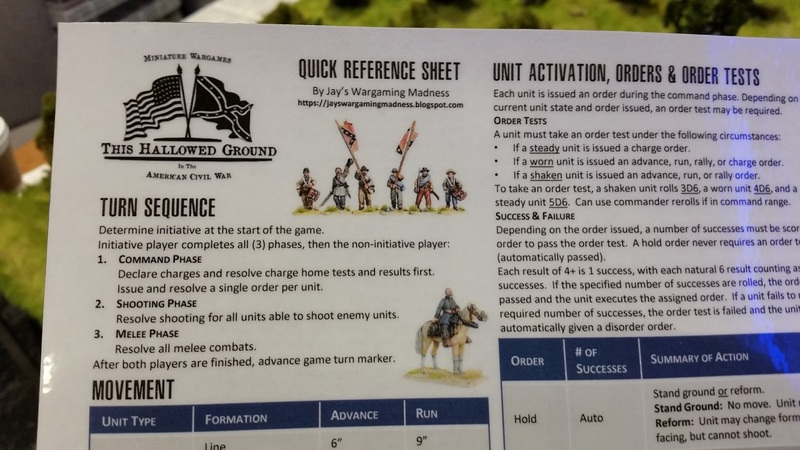 The rules were a simple but realistic homebrew they've been using for a while, and have in Napoleonic and Civil War flavors. 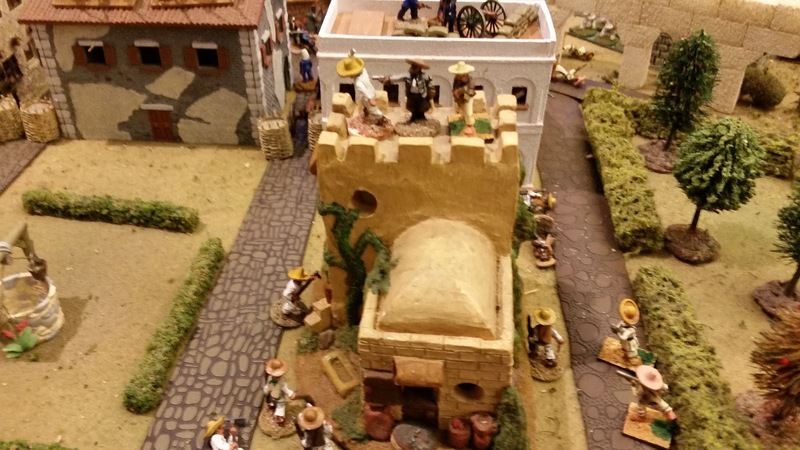 Here, a unit was a battalion, regiment, or battery and players push a brigade. Most battles handle a division, and they have a pretty good little morale system. 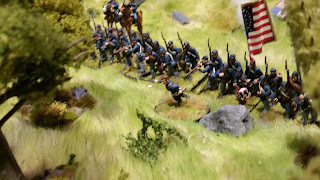 I hadn't been able to get into their modern, Napoleonic or Pickett's Charge and McPherson's Ridge games, but by Sunday night, with the Con winding down, I saw a seat available and snapped it up. 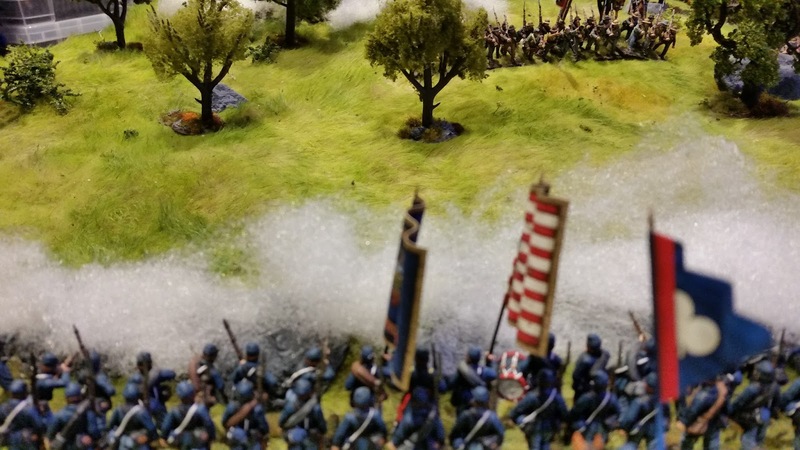 The scenario was a compressed part of the fighting on the Union Left Flank on Day 2 of Gettysburg. I was handed Vincent's Brigade (3rd Brigade, 1st Division, V Corps, Army of the Potomac,) and given the end of the Union line, told to hold Little Round Top. Given the Confederate dispositions, I was told, if practicable, to push up Big Round Top and flank 'em. As it turned out, those instructions were rather prophetic. Massed on Big Round Top were five Confederate regiments, from two different brigades. 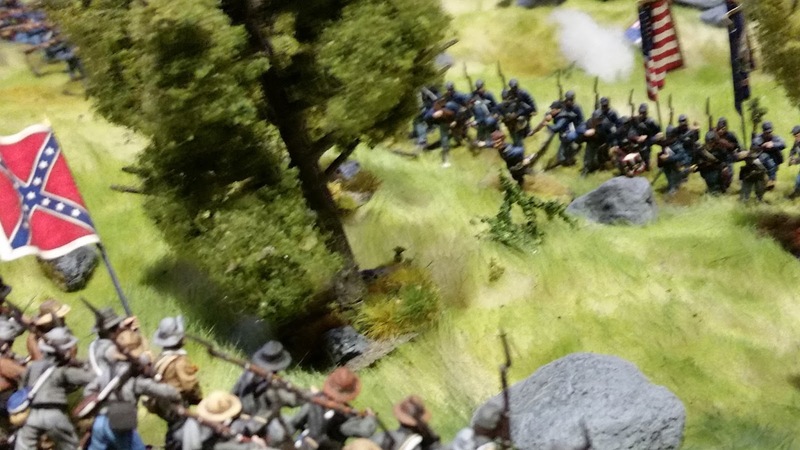 Half the Confederates (Hood's Texans), pushed across the valley into the Devil's Den. Three regiments decided to slow down and deploy for a musketry duel with my brigade. Snug behind fat rocks on high ground, and with an extra regiment and battery in my favor, I decided to oblige them. The rules are generally a bucket of dice game, with lots of d6 rolled for firing or melee (number based on formation), with attendant saves and modifiers. Morale is basically rolling higher than the number of casualties you've taken. Depending on how shot up you are, you may have to check to see if you obey orders. Simple, easy to learn, lots of fun. Fortunately, I had purchased quite a few dVI from the Chessex booth at the Dealer's Hall. Given the academic bents of both Vincent and Col. Joshua Lawrence Chamberlain of the 20th Maine, using the Roman Numeral dice seemed apropos. Lots of IV, V and VI (needed for hits and passing morale) and V and VI (needed to make saves) followed, and soon the Confederate regiments were shot up. At this point, the game master passed by and handed me a new miniature. 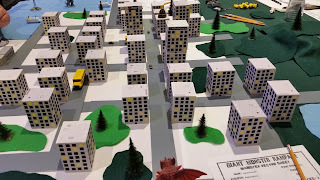 He hadn't mentioned it in the pregame brief, because none of the playtesting had born it out, but there was a special Chamberlain rule, allowing me to reroll tests to charge and morale checks for one turn. With the Rebs faltering and pulling back, it seemed time. Especially since the Devil's Den had fallen, and the Confederates were pushing the other Union forces back to the swamp. The Chamberlain miniature was mostly for the photographs. The few Confederates left mostly pulled back, and their departure from the field was hastened by a few volleys of musketry fire. But the timely move up Big Round Top secured us ten victory points, holding Little Round Top netted five more, and the three Confederate regiments leaving secured another three, contributing eighteen to the overall Union score of twenty-four. With the Confederates securing the Devil's Den and chewing up the Union forces there, it was a draw, 28 (Confederate) to 24 (Union), or pretty much how it turned out historically. Plus, it was a beautiful game - beautifully painted miniatures on absolutely beautiful terrain. Exactly what I needed to inspire me to get back to painting. So that was KublaCon. In the week since, I have finished up another few miniatures for my Colonials, and am itching to get back to my Plains Wars collection. Also, I need to get one of those teddy bear mats. Well done on your 3rd place in the speed painting and great blog BTW. Please send me an email so we can set up comms for the Challenge, thanks!